Then a client who’d ordered two large and complex prints admitted, at the risk of offending the artist, that he intended to give them to his sons for the same purpose. Adult colouring is everywhere now—worthy of a curated table at Indigo, and group colouring nights that bring hipsters to venues such as the Gladstone Hotel in Toronto—but back in 2014, it was just taking off. After McDonald began to pitch publishers, a bidding war ensued for one of his projects. He then signed with San Francisco’s Chronicle Books for a collection of drawings of urban scenes. That book, Fantastic Cities, has now been published in two dozen countries. “It’s a bit of a magical story, obviously,” he says of the volume’s success. He figured it might sell a few thousand copies. He had no idea he was on the cusp of a breaking trend. By the end of 2016, Fantastic Cities had sold more than half a million copies worldwide. It was number six on BookNet’s Canadian non-fiction list for 2015, beating out two volumes by Chris Hadfield. “We thought it was a blip,” McDonald says. But sales kept building. The cities in Fantastic Cities are real. McDonald studied aerial photographs of such places as Bremen, Germany; Stockholm, Sweden; Himeji, Japan; Mont-Saint-Michel, France; and even the shipyards of Collingwood, Ontario. He then created line drawings using either pen and ink on paper, or a stylus on an oversized computer tablet. The drawing of Bremen, for example, shows row after row after row of urban residential streets from a bird’s-eye view. The design is rhythmic and detailed; a close look reveals windows and skylights no bigger than grains of rice. But no house is the same as any other. The drawings have clearly been hand-drawn—they’re not mechanical, not the products of apps or programs. The actual architecture of Bremen (and pretty much any urban place in the world) seems banal and repetitive until you get up close and see, for better or worse, the human touch. That’s ambitious. I mean, it’s a colouring book. Traditionally, the genre’s goal has not been to contemplate mortal hubris and that which humans wrought. The point was to colour inside the lines and not make a mess. But, in fairness, adult colouring books—the good ones—serve a different purpose: they take your mind off stuff. They are more in the spirit of the paint-by-number sets of the 1950s, which supplied an image already divided up into sections, and paints that could be applied according to a predetermined code. Or DoodleArt of the 1970s, trippy black-and-white designs in large poster-sized prints that were meant to be coloured in with markers, and became a favourite of stoned adults. Or crochet kits, or model railroads, or anything that calls for tight focus and repetitive, but still arguably constructive, activity. They go back to Byzantine mosaic art or the rosary: you worked at something not intellectually demanding for a period of time and felt better. 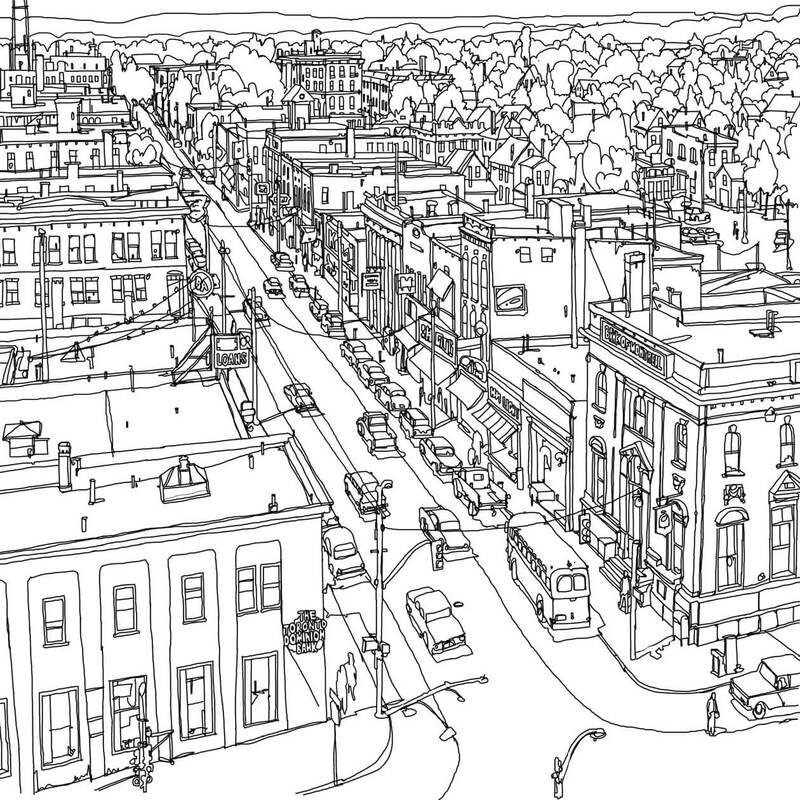 He drew buildings and cities, both real and imagined. He was influenced now not by A.Y. Jackson, a founding member of the Group of Seven, but by such graphic and comic artists as Jean Giraud, known as Moebius, and such writers as Italo Calvino. “I’m a big fan of Calvino’s work,” he says. 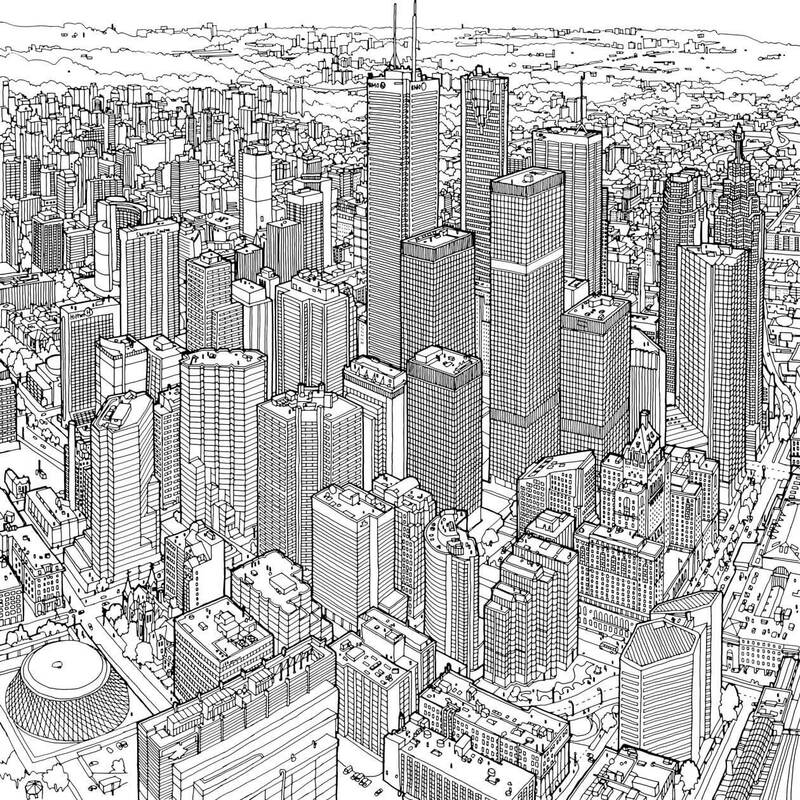 “He creates these magical fantastical worlds, slightly beyond reality”—which is as good a way as any to describe the slightly off-balance feel of McDonald’s cities in this colouring book: they look real and fairy tale–like at the same time, as if they owe much to a technical truth but even more to the artist’s imagination. These are cities the way McDonald wishes they looked. So, yes, it’s art. Toronto, from Fantastic Cities (2015). So adult colouring is not art, but it is a cover version of art—something creative to do until art comes along. McDonald shows me some examples of the colouring sent to him by his fans: there’s a dark vision of a metropolis submerged in water and patrolled by sharks. For some, McDonald’s line drawings are just starting points for weirder, more expansive and original graphic ideas. “I’m not giving you the rules just to fill them in. Referring to one of his fan colourers, he says, “she changes the weather in the pictures. She puts vines on buildings and everything, makes it post-apocalyptic.” I recall the same kind of thing happening with paint-by-numbers: you would paint Gainsborough’s The Blue Boy orange and give him red devil eyes just to be subversive, and all due respect to the creators of Casper the Friendly Ghost colouring books, it was liberating to go outside the lines.